It has been straight-up cold the past few mornings here in Burlington, and the chilly temps have me scrambling to pull together my fall/early winter wardrobe. We moved this summer, and in the chaos of storing and moving different things, I put away a lot of my warmer jackets, sweaters, and scarves somewhere, and I'm still trying to figure out exactly where that somewhere is. The basement? Under the bed? My dad's garage? I know that they're safe and sound in a plastic bin somewhere, but I really need to figure out where that somewhere is, fast. So while I'm having a hard time tracking down the cold weather clothing I already own, I have no problem filling their void with a few new options. I snagged a new H&M parka online and stocked up on Carhartt beanies in the men's section of Sierra Trading post, and now I'm feeling a sudden urge to buy a pair of Uggs. I didn't have the funds to buy a pair the first time they were cool (hi, 2005), but their latest attempt at It Girl branding has me ready to spring for a pair this time around. Alexa Chung recently art directed Ugg's new fall campaign, and she recruited some of her fabulous friends to wear the brand's iconic furry boots in it. The Vermonter in me is saying, yes, they're practical and warm! and the shopper in me is like, they're cool, you need them. So I guess that means I'm buying a pair - I'm thinking of something water repellent, black, and just a little basic. As part of my fall wardrobe revamp, I've been shopping for some new jewelry to add something new to my otherwise neutral wardrobe of striped shirts, button downs, and sweaters. I discovered Mod + Jo on Instagram, and their use of natural materials and on trend styling makes it a perfect score for Fall 2016. Chokers? Check. Tassel earrings? Check! Most pieces are under fifty bucks, too, so while they aren't as cheap as the options at H&M right now, they're a much better investment. See some of my favorite picks below. Material and simplicity. These are the two self-declared core components of both A.P.C., the French label that is known world-wide for it's stylish yet simple essentials, and Outdoor Voices, the up-and-coming brand that dresses cool kids who shun labels on their way to Soul Cycle. Their new collaboration, A.P.C.O.V. - shoppable as of August 31st, is the perfect marriage of minimalist athleticism that takes athleisurewear to an uncharted place of understated sophistication. These pieces build outfits that feel equally balanced with a thick pair of Nikes or thin calfskin ballet flats, and you won't find a single pop of neon or a panel of mesh anywhere in this collection built on greys and blues. 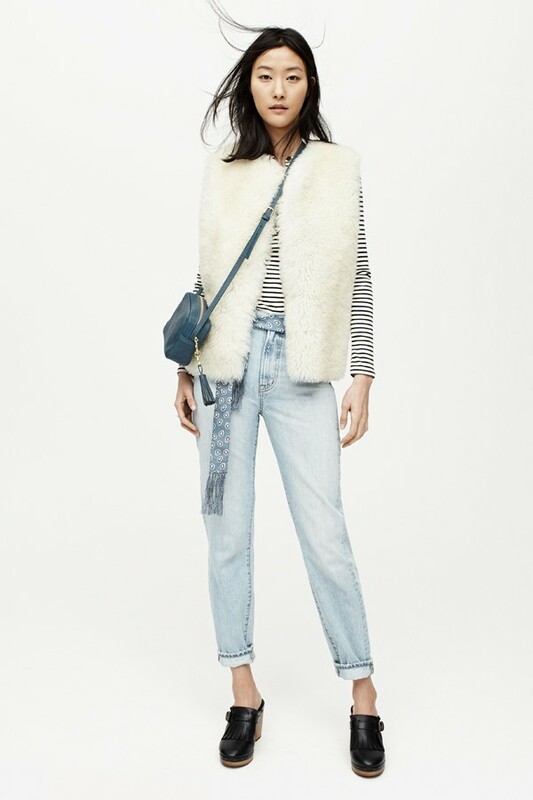 Every season, I get almost too excited when Madewell releases a sneak peek of its next collection. Sure, it's nearly 90 degrees outside and I still have plenty of tanning to do before fall starts, but I couldn't help but want to grab my credit card and hit add to cart as soon as I saw a new lookbook from this brand. This first look for Fall 2016 doesn't disappoint, and features certain elements that I want to start implementing into my current rotation right now: lace-up tops, not-so-basic denim, lots of layers, classic kicks (I needed Adidas Gazelles, like, yesterday), and texture on top of texture. It all looks cozy and chic as hell. I can wait a few more months before shopping for colder temps, but this collection is definitely making this harder than I expected.